One of the longest-running primetime dramas in the history of American television, this nighttime soap kept viewers glued to their sets for its entire 14-year run, lured back each new season by masterful cliffhangers ("Who shot J.R.?"). Relive the saga of the oil-rich, feuding Ewings, a tale of big hats, dirty business, schemes, and Pam's dreams. Larry Hagman, Barbara Bel Geddes, Jim Davis, Ken Kercheval, Patrick Duffy, Linda Gray, Victoria Principal, and Charlene Tilton star. 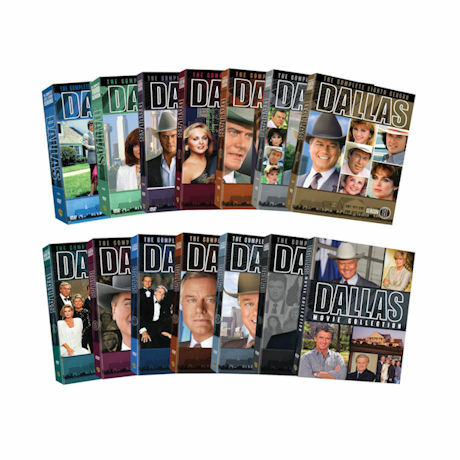 Set includes all 14 seasons and the 3 reunion movies. 357 episodes, 291 hrs, 57 DVDs.